ATLANTA (AP) -With Colorado playing its third game in four days, coach Joel Quenneville hoped the Avalanche would stay focused on the playoffs. Jones, a ninth-round draft choice in 2003, scored his first career goal to make it 4-1 in the second. Now in his third stint this season after the Avalanche recalled him again from Lake Erie of the American Hockey League, Jones wants to savor his first goal. Hedberg, who dropped to 13-20-5, stopped 18 of 23 shots before coach Don Waddell pulled him in favor of Kari Lehtonen to begin the third. Waddell indicated the Thrashers have more problems right now than just poor goaltending and inadequate defense. Notes: C Peter Forsberg (groin) missed his second straight game for Colorado. ... After fighting Stars D Steve Ott in a 3-0 loss at Dallas on Sunday, D Ruslan Salei returned to Denver to have his injured eye examined. 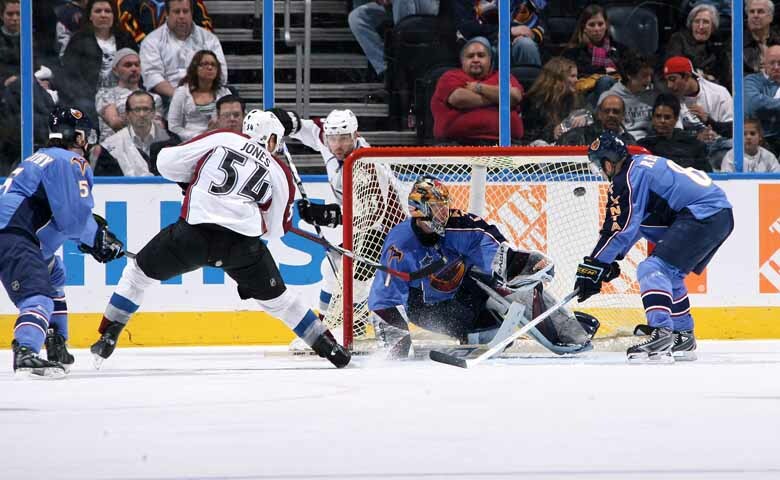 ... C Paul Stastny earned his team-high 37th assist and third in four games on Brunette's second goal. ... The Avalanche have killed 22 straight penalties. ... Colorado improved to 5-1 this month, 16-2-2 in March over the past two seasons. ... Alexei Zhitnik, Atlanta's highest-paid defenseman, was a healthy scratch for the third straight game. ... Colorado, 8-1 against the Eastern Conference, ended a three-game losing streak to the Thrashers to earn their first win in Atlanta since 2002.